With its deliciously soft, doughy inside and crusty outside, the boiled-then-baked bagel is a favorite for breakfast, lunch, and snacks! Bagels come in all sorts of flavors and varieties and with toppings for every taste, there’s no denying that the bagel is comfort food at its best. To celebrate today’s holiday, visit your favorite bakery and enjoy! Image copyright Sandy Nichols, 2018, text copyright Andrew Larsen, 2018. Courtesy of Kids Can Press. One Sunday, though, the familiar knock on the door never came. Later, Zaida called Eli and told him he had “slipped on some schmutz at Merv’s” and had gone to the doctor. Zaida had hurt his tuches and was ordered to relax at home for two weeks. Eli ran right over. As they sat together, both Eli’s and Zaida’s stomach rumbled with missing the usual bagels. Pretty soon there was a knock on the door and three of Zaida’s elderly neighbors came in. All three were just as hungry as Eli and Zaida. It turned out that Zaida had been hosting a bagel feast for the four of them for years. When Zaida told them about his tuches, they said “‘Oy! Are you all right?’” But they were all disappointed about the bagels. A glossary of the Yiddish words used in the story and a bit about bagels and chicken soup precede the text. With a sprinkling of Yiddish words and an old neighborhood atmosphere, Andrew Larsen depicts a close relationship between a grandfather and grandson who bond over bagels, pickles, and a deep love for one another. While Zaida is the one who begins the Sunday bagel tradition, this is Eli’s story as he takes it upon himself to help his grandfather recuperate and makes sure that he, Zaida, and Zaida’s friends don’t miss their favorite day for a second time. Young readers will find in Eli a peer role model for showing care and concern for family members and friends. Larsen’s straightforward storytelling peppered with realistic and humorous dialogue is as warm and cozy as sitting down to a Sunday family breakfast. Sandy Nichols’ fresh, retro illustrations stylishly bridge the generations while also reveling in the friendly city neighborhood feeling that provides a backdrop and context for Eli’s emotional growth within the story. Images of Eli hanging over the arm of his grandfather’s sofa in boredom and disappointment, wistfully dreaming of bagels on Saturday night, and proudly making his list, buying the bagels, and delivering them—complete with a surprise—to Zaida and his friends will delight readers. The Bagel King is an uplifting, joyful for all kids coming into their own and desiring to make a difference. The book would make a sweet gift for grandparents or grandkids, a snug family story to add to home libraries, and a terrific choice for classroom or library storytimes. Discover more about Andrew Larsen and his books on his website. Do you have an old CD that could use an upgrade? With this easy craft, you can turn it into a cute doughnut (or bagel) hanging. The feel of a cozy mitten on freezing fingers is one of the luxuries of wintertime. But where did mittens come from? You might be surprised to discover that the word “mitten” comes from the French word mitaine, which was an old nickname for a cat, because early mittens were typically made of animal fur. The earliest mittens, dating to around 1000 AD, were used as sheaths for gloves, adding extra protection for cold hands. 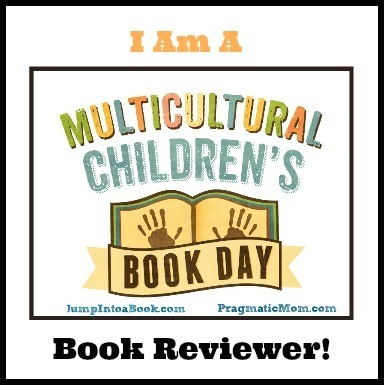 Today, I’m pleased to review the book in which Mitten Tree Day is said to have its origins! Originally published in 1997, the story has endured and continues to spark programs in schools, libraries, and communities around the country. In a small house at the end of a lane Sarah lives all alone. Her own children have grown and moved away, but as she watches the kids gather at the blue spruce tree to wait for the school bus she remembers all the years that she walked her son and daughter to this same spot. As she makes her way down the lane to her mailbox, she wishes the children will wave and smile, but they never seem to notice her. Still, it makes Sarah smile to see them. Image copyright Elaine Greenstein, 2009, courtesy of Fulcrum Publishing. One winter morning Sarah notices all the kids throwing snowballs and making snowmen—all except one little boy dressed all in blue who lacks the mittens needed to join his friends. All day Sarah worries about the boy with no mittens. As the sun goes down Sarah digs “through the basket of yarn scraps she had saved for many years.” She finds her needles and four shades of blue wool. Then Sarah begins to knit. With the rising sun Sarah hurries to the bus stop and hangs the new blue mittens on the spruce tree. Then she hides behind a hedge to watch. The little boy in blue is the first to arrive at the bus stop. When he sees the mittens hanging there, he tries them on and finds that they fit perfectly. With a big smile he makes “a perfect snowball” and throws “it high into the winter sky.” Soon Sarah sees a little girl with mismatched mittens. That night she finds the perfect color of wool and knits a pair to match the girl’s red coat. Image copyright Elaine Greenstein, 2009, text copyright Candace Christiansen, 2009. Courtesy of Fulcrum Publishing. Every morning Sarah watches the children, looking for any who have no mittens. During the day her needles are busy making gifts for these children. The next morning before anyone else is up she rushes to the spruce tree and adorns it with the mittens she has knitted. The children have warmed to the “game,” and each day search “under every branch and bough for another pair of mittens.” Once or twice Sarah thinks the boy with her blue mittens sees her, but his eyes don’t linger. On the day before the school’s winter break Sarah fills her knitting basket with the latest mittens she’s knit. She heads out the door and down the lane. When she reaches the blue spruce, she hangs “mittens on every branch.” When the children arrive, they stand “very still for a few minutes looking at the mysterious, beautiful mitten tree.” As they board the bus, each child is wearing a new pair of mittens. Sarah sees them appear one by one in the bus windows, but none see Sarah. Candace Christiansen’s heartwarming story of kindness given and reciprocated will inspire kids to see that anyone can make a difference in the lives of others by using their talents to fill a need. This gentle, quiet tale offers suspense that will pique readers’ curiosity from page to page, and the mystery surrounding the never-empty basket of wool provides a satisfying and moving ending that also reassures kids that deeds of thoughtfulness and compassion are noticed. The grandmotherly Sarah and familiar school bus stop setting and winter activities will resonate with readers. Elaine Greenstein’s softly colored, folk-style illustrations give the story a cozy feeling—perfect for cold-weather reading, The variety of intricately knitted mittens, with their hearts, stripes, snowflakes and cables, are charming, and the enchanting image of the blue spruce decorated with mittens makes it easy to see how The Mitten Tree continues to inspire so many acts of kindness and charity. Mittens often get lost or mismatched in the fun of winter activities. Find the pairs in this printable Mitten Match & Coloring Page and then decorate them! What would we do without authors? Through their imagination we’re transported into new realms, learn fascinating facts about the world around us, and laugh, cry, and come together as we collectively embrace their characters. Today’s holiday was established in 1928 by Nellie Verne Burt McPherson, who was an avid reader and grateful owner of a signed copy of a story by Irving Bacheller. To show her thanks, she instituted Author’s Day. The holiday was officially recognized in 1949 by the US Department of Commerce. To celebrate, people are encouraged to write a note of appreciation to their favorite author. In all her many years, Mrs. Badger has “seen many things.” A small collection of things on her kitchen shelves reminds her of all the places she’s been. But every Sunday, Mrs. Badger goes on an adventure that is always the same and always different. She walks the path that leads from her home to the top of a small mountain. Copyright Marianne Dubuc, 2018, courtesy of Princeton Architectural Press. On her way out of her garden, she says hello to Frederic, a white-throated sparrow. She picks mushrooms for Alexander the fox, careful to avoid the poisonous ones, and if she encounters someone who needs help, she lends a hand before moving on. This Sunday, though, “she has a feeling she is being watched.” Without turning to look, she says “‘There’s enough for both of us, if you’re hungry.’” Out of the bushes bounds a kitten. They eat together and Mrs. Badger tells the kitten about Sugarloaf Peak. The little one would like to see it too, but is afraid of being too small. Even though Mrs. Badger reassures her new friend, the kitten stays put, so Mrs. Badger continues on her way. In a moment, the kitten is by her side. Lulu is her name, she tells Mrs. Badger. They find walking sticks and travel over a stream, through trees, and along the path. Lulu asks lots of questions, but “Mrs. Badger teaches Lulu how to listen instead, how to help others, and that life is made up of many choices. When they come to a fork in the path, Mrs. Badger lets Lulu decide which way to go. She knows “that you have to listen to your heart.” On the way, they sing songs and stop to rest beside a blue pond. As the path grows steeper, they know they are near the top of Sugarloaf Peak. Will, a turkey vulture who has known Mrs. Badger for a long time welcomes them. When they reach the top, Mrs. Badger gives Lulu a hand to scramble up the last few feet. One Sunday when Lulu comes to Mrs. Badger’s house, she “doesn’t have the strength to climb Sugarloaf Peak,” so Lulu goes alone. Her solo journeys continue week after week, and every time she returns to Mrs. Badger’s to tell her “all about her discoveries. She also brings new treasures” for Mrs. Badger’s shelves. “Gradually, Mrs. Badger’s mountain becomes Lulu’s mountain.” One day, Lulu finds a path she’s never taken; she also has the feeling that she is being watched. Without looking, she offers to share her snack—and then to share the path to the top. Marianne Dubuc’s poignant story about one’s path through life celebrates the gathering of knowledge and experience and the passing on of this acquired wisdom to younger generations. In her quiet, straightforward storytelling, Dubuc builds a deep understanding of Mrs. Badger through her kindness, philosophies, and willingness to share. Her excellent pacing—which sees Mrs. Badger as a lone traveler then accompanied by Lulu and finally happy to hear about Lulu’s solo adventures as Lulu then takes up the mantle with a new friend of her own—movingly demonstrates the cyclical nature of life. Duboc’s charming illustrations, rendered in greens and browns sprinkled with bright color are adorable and as endearing as a hug. The sweet smiles and connections between characters mirror the patience, kindness, and understanding we all want our children to experience on their journey. Up close images of Mrs. Badger’s treasures combined with the vast vista from the top of Sugarloaf Peak reveal that happiness springs from paying attention to the small details as well as the big picture. A heartwarming, uplifting, and life-affirming book, Up the Mountain Path—which was named a Best Picture Book of 2018 by Publishers Weekly—is a treasure to add to home, classroom, and library bookshelves. Today’s holiday encourages people to write letters thanking their favorite authors. If you wrote a letter to your favorite author, what would you say? 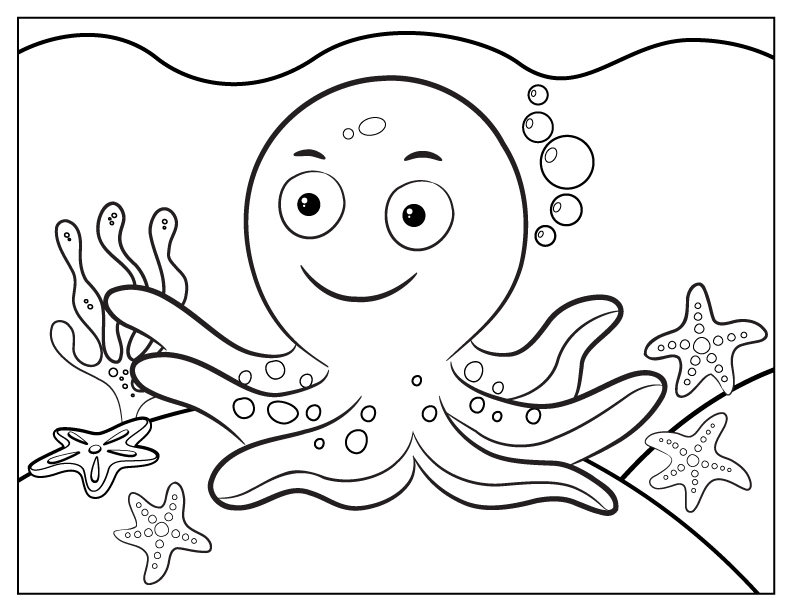 Color the book and then jot down your letter on this printable Book Notepaper. Noodle on this: what’s the difference between noodles and most other dry pastas? Noodles contain eggs! It’s just this kind of fascinating fact you can learn on National Noodle Day. Whether you like spinning the long strands around your fork or slurping them right from the bowl, noodles make the perfect comfort food whether they’re mixed with sauce, pesto, or meat and veggies. People make some pretty awesome crafts from them too! And that’s not just modern-day creativity, either. Thirteenth-century bakers made their dough into birds, stars, words, and other shapes. To celebrate today enjoy your favorite noodle recipe! The emperor’s birthday is coming, and everywhere excitement fills the air. Mei’s Grandpa Tu will no doubt be making his famous noodles for the celebration. Mei loves to watch her grandfather work, slapping and kneading the dough and pulling the strands of noodles. He is so creative with his cooking that everyone marvels, even the Moon Goddess. In fact, Grandpa Tu is such an extraordinary artist that he makes noodle jump ropes and kite strings for Mei and her friends. They are as “simple as a sunflower” and as “easy as a sea breeze” to make, says Grandpa Tu. But Mei thinks there is more to his talent and wishes that she had his magic. Her grandfather believes she does possess it. One afternoon the pair watch animal-shaped clouds fill the sky, and Mei asks if her grandpa can catch them with noodles. That night he makes a batch of noodles, and in the morning the two collect clouds as the sun appears. On the day before the emperor’s birthday, everyone is busy making something special—everyone except Grandpa Tu. The villagers are perplexed. On such an important day, they will all want to enjoy noodles—and what about the special long-life noodles for the emperor? It is time, Grandpa Tu tells Mei, for her to make the noodles. Mei is surprised and terrified. She slaps and kneads the dough as she has seen her grandfather do, but it remains ordinary. Where is the magic? “‘Trust in yourself,’” Grandpa Tu tells her, but Mei is doubtful. She decides that perhaps if she gives the Moon Goddess a gift, she will get magic in return. “‘You have all the magic you need,’” her grandfather assures her. Still, he helps Mei make enough dough to form an enormous ball of noodles. Mei throws the ball to the Moon Goddess and calls out for the Goddess to give her magic. Wisely, the Goddess reminds Mei that magic must come from inside. Mei closes her eyes and thinks very hard. She tussles with the Moon Goddess in a noodle tug-of-war, and suddenly…Snap!…the noodles break. The sky rains noodles of all shapes and sizes, Mei has discovered the magic that was in her all along! With the charm of a Chinese folktale, Roseanne Greenfield Thong tells the universal tale of self-discovery. Her lyrical language adds a magic of its own to the tale, as when Mei watches her grandfather make dough: “she loved the powdery flakes that hung in the air and freckled the morning light.” The relationship between the little girl and her grandfather is lovingly portrayed, offering a gentle depiction of the wisdom and reassurance provided by extended family members. Meilo So brings the story to vibrant life with her colorful paintings of village life, Mei and Grandpa Tu’s home, and the Moon Goddess. The magic of Grandpa Tu’s noodles is cleverly shown in the transparent animals, dragons, and birds outlined in noodles that frolic across the pages. The two-page spreads of Mei’s village are particularly captivating, as packed with interesting scenes and details as any bustling town. To learn more about Roseanne Greenfield-Thong and her books, visit her website. Discover more about Meilo So, her books, and her art on her website. Everyone has their favorite kind of noodles! 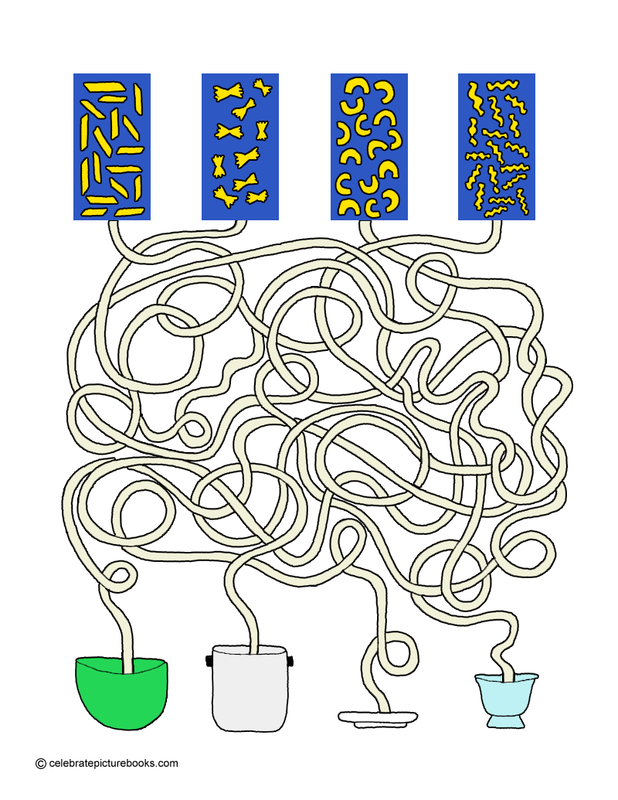 Help these noodles get to the right plate, bowl, or pot in this printable Noodle on This puzzle that’s as wiggly as a wet noodle! The National Sleep Foundation sponsors this special day to recognize the importance of a good night’s sleep. Surprisingly, getting enough shut-eye may begin in the morning after you get up. By making your bed each morning, you create a tidy and inviting atmosphere that’s conducive to falling asleep quickly later in the day. In fact, your sleep environment makes a big difference in how you (or your kids) sleep at night. The right temperature, lighting, and mattress all play a factor. So, at least for today pull up those sheets and comforter. And donif you really like to just jump up and go, Don’t Make Your Bed day is coming on December 21st! “With a rain of gold” the sun sets for the night. All around the creatures of the forest are getting ready for bed. “The nightingale prepares her nest. Ants gather their provisions. And the toad jumps into a bucket.” But Miyuki is nowhere to be found. Of course, Miyuki is still playing and isn’t near ready for sleep. First, she tells her grandfather, she must “prepare for the arrival of the Dragonfly Queen” and her court. She asks Grandfather to help her build a canopy under the cherry tree, but when it is finished Miyuki says she must water her garden. Image copyright Seng Soun Ratanavanh, 2018, text copyright Roxane Marie Galliez, 2018. Courtesy of Princeton Architectural Press. Many trips back and forth from the well later, Miyuki is still not tired, but she is concerned with rounding up the Snail family and leading them home. After this slow procession, Grandfather says, “‘Miyuki, the canopy for the Queen is complete, your vegetable garden is watered, the snails are gathered. It’s time for bed.’” But there’s just one more thing to do, Miyuki tells him. It’s a cold night and the cat needs a blanket. With a dreamy, dozy lilt, poetic phrasing, and beautiful word choices, Roxane Marie Galliez tells a story of sleep delayed by a little girl with a fanciful imagination and her doting Grandfather. Steeped in the wonders of nature, Miyuki’s bedtime ritual celebrates her favorite creatures, her garden, her cat, and even the sun itself. Even her bath and best pajamas are not for her but for the stars when they visit. As each task is completed, Grandfather adds it to the list, in a repeated stanza that invites children to read along as it grows sequentially. The cyclical ideas of day and night, sleeping and waking, and even bedtime routines are sweetly reflected in Grandfather’s story that takes readers back to the beginning of the book. Seng Soun Ratanavanh plays with perspective, whimsical juxtopositions, and gorgeous colors, patterns, and textures in her inventive watercolor and colored-pencil illustrations. As small as the Dragonfly Queen, able to dance atop mushrooms, and tiny enough to fit in a flower pot or ride a kite, Miyuki and her grandfather navigate through the natural world as they complete Miyuki’s long list of pre-bedtime duties. With pencils as stilts, Miyuki helps herd the snails home, and sitting on the handle of the kitten’s basket she knits a cozy blanket. The image of Grandfather tucking Miyuki into a red shoe that sits on a tree stump surrounded by tall stems of tiny glowing flowers is exquisite. As Miyuki falls asleep readers see that her dreams are populated by her bountiful imagination. A charming and elegant tale of imagination, Time for Bed, Miyuki would make a marvelous addition to home and classroom libraries for bedtime and quiet story times. 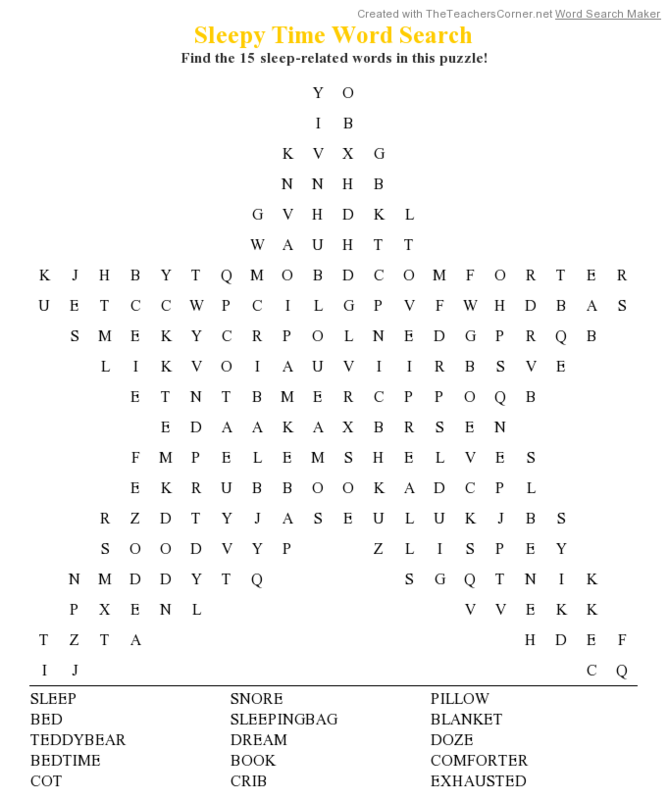 Can you find the 15 sleep-related words in this printable, star-shaped Sleepy Time Word Search? Here’s the Solution! During National Fishing Month individuals and families are encouraged to try their hand at this fun outdoor sport. Whether you catch and release or eat what you catch, casting your line, seeing the bobber wobble, and feeling that exciting tug on the fishing pole makes for a fun day. Image copyright Poly Bernatene, 2017, text copyright Gideon Sterer, 2017. Courtesy of Abrams Books for Young Learners. That green plastic bag on the end of the hook was just the beginning. After learning the rules—always return what you catch and “where there’s one fish, you can bet there will be more”—the two caught “Chimefish, and Signfish, Laundry Eels and even a Cold-air-square.” But all of those things were stationary and easy to catch. Down below, however, “the sidewalk flowed slowly”; it was a perfect place to practice trawling. “Capfish were the first to bite. Then Songfish, Goldfish, and fish “from foreign shores.” As Grandpa and his granddaughter became more proficient, they reeled in “Furry Snappers” on leashes and “Hammerheads” drilling holes. Even a “Grillfish” was on the menu. Next, it was time to try their luck in the ocean of the street where larger and faster fish lived. Here, “Zoomfish, Mailfish, Glowfish, and more Yellow-stripers than [they] could count” waited. There were also mammoth creatures like the “Stretchfish,” Waste-muncher,” and “Constructionfish,” but down below these—in the murky depths—lived the largest fish of all. Grandpa and his granddaughter studied just how to set their line, they lowered it slowly and were not surprised when they felt the tug of the…oh, no!…“Troublefish” with sirens blaring. Gideon Sterer’s debut picture book gently and creatively addresses the issue of grandparents transitioning from their own home into another living situation. As an outdoor-loving grandpa comes to live with his family in the city, his caring granddaughter discovers a way for him to continue his beloved pastime while they also form a strong bond. Sterer’s clever idea of dry-land fishing along with his witty names for the fish found in the concrete depths will enchant readers and entice them to devise species of their own. The sweet ending in which both Grandpa and Granddaughter are ready to explore the city and new experiences together is satisfying and uplifting. With perfect pacing and a growing sense of wonder, Poly Bernatene leads children from Grandpa’s sparkling blue lake to his granddaughter’s city apartment to the first glimpse of their fire escape trophy. Children will be charmed by the ingenuity of the plastic-bag fish dangling on the line and, like the little girl in the story, will be hooked on what comes next. 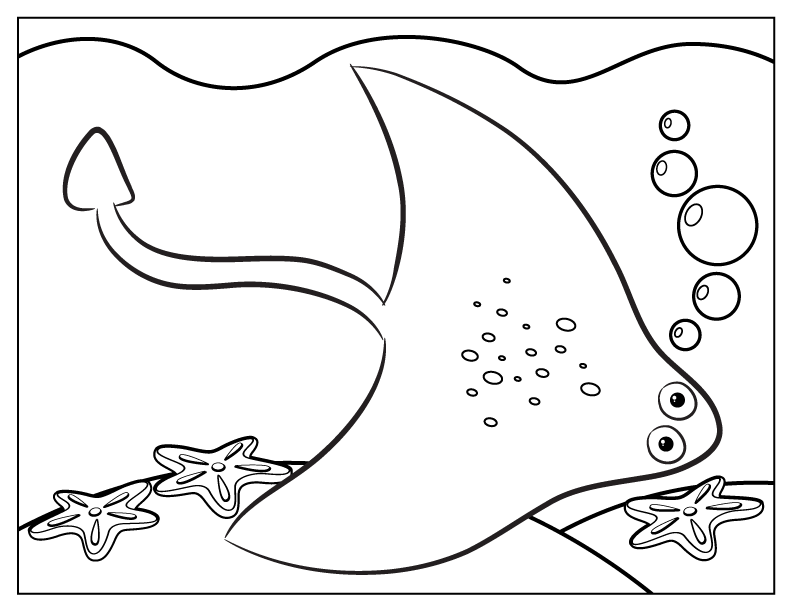 As the waters rise and the people and objects down below slowly transition to fish and other humorous sea creatures, readers will love exploring the watery world and learn to look at their own neighborhoods in a whole new way. To learn more about Gideon Sterer and his books, visit his website. Discover a gallery of artwork and books by Poly Bernatene for children, young adults, and adults on his website. A good fisherman always needs a well-stocked tackle box. Play the Tackle the Tackle Box Game to earn lures, bobbers, hooks and more to fill your box. The first player to complete their set is the winner! For more fun, you can color the tackle box items any way you like. There are even three extra cards for you to draw your own tackle box items! 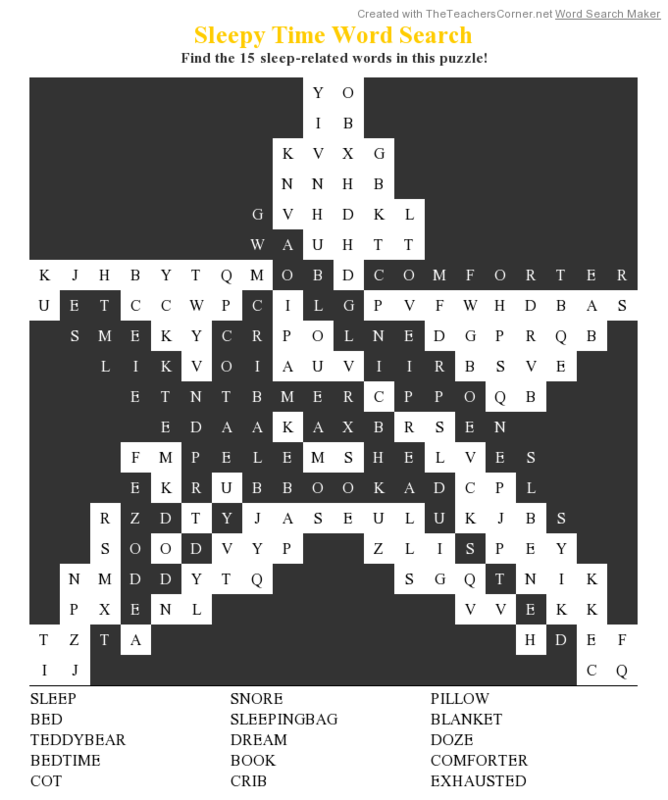 The first player rolls the die, and adds the item that corresponds to the number on the die. The list is below. The first player to fix their tackle box is the winner! The world’s oceans offer beauty, resources, and mystery. This month we celebrate these vast wonders while committing ourselves to their preservation. Pollution, climate change, and habitat destruction all threaten the fragile ecosystems that exist in and near the sea. We also remember the communities that rely on the oceans for economic stability as well as the men and women who work to protect the oceans and their unique creatures. Copyright the Fan Brothres, 2018, courtesy of simonandschuster.com. When Finn grew tired, he lied down for a nap. Upon waking, he felt the boat rocking and saw that the adventure had already begun. Magical clouds—a whale, a clipper ship, an anchor, and elephant, and an old captain’s pipe—floated above him. But Finn grew lonely as the boat sailed into the night. A “great, golden fish” noticed Finn and approached the boat. As the moon jellies soared into the sky to meet floating craft of all kinds, Finn wondered if he had found the place he had been looking for. Suddenly, his boat “began to lift from the water… or had the water fallen away?” His little boat joined the other fantastical ships, hot air balloons, and air ships that plied misty waves around a huge, floating whale. More and more ships, fish, kites, sea creatures, and even a castle joined the throng that soared past the full moon. When the golden fish began swimming toward the moon, Finn followed. In the moon’s shining roundness, he saw the face of his grandfather, and “he wanted to say goodbye.” Although Finn had many questions for his grandfather, he turned when he heard his name called from far away. His grandfather sent Finn on his way home. The Fan Brothers’ distinctive mastery with mystical storytelling, combined with stunning illustrations that awaken the imagination in children and a wistful yearning for bygone dreams in adults, transforms a story about a boy’s feelings for his departed grandfather into heartening reassurance that a loved one is always with us in memories of moments, teaching, promises, and activities shared. Readers will be enticed to linger over every page of Finn’s mysterious and enchanting dreamscape, and the tender ending anchors the story in a tangible way that Finn and his family honor his grandfather. Ocean Meets Sky casts a spell that lasts long after the covers have been closed and will beckon to be read again and again. Discover more about Eric and Terry Fan, their books, and their art on their website. The ocean is full of amazing creatures. 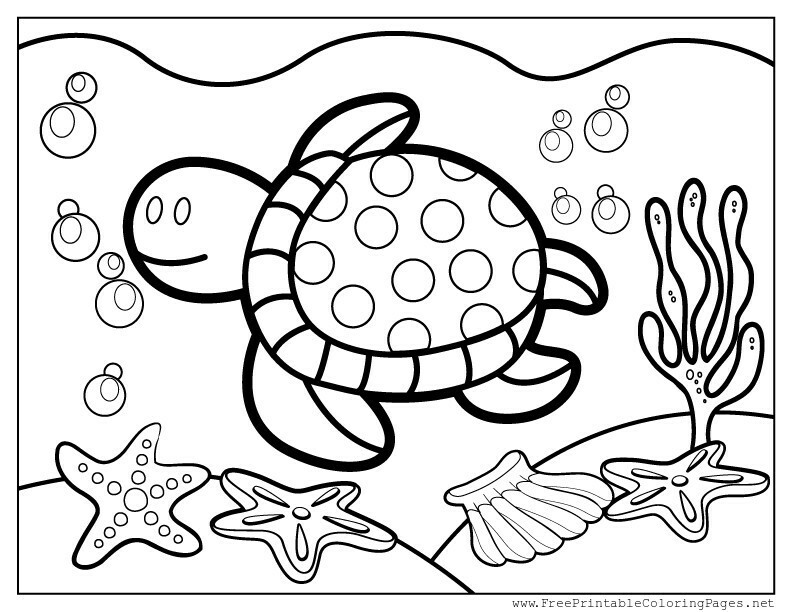 Here are three printable coloring pages to dive into!